Middle Imperial Roman Legionary Command. Citizen warriors who defended and expanded the Roman Empire from 193 AD to 324 AD. Four figures per pack with seperate shields. Figures are not supplied with Spears. We do supply wire spears in a seperate pack, look to code NSS102 for the most suitable. 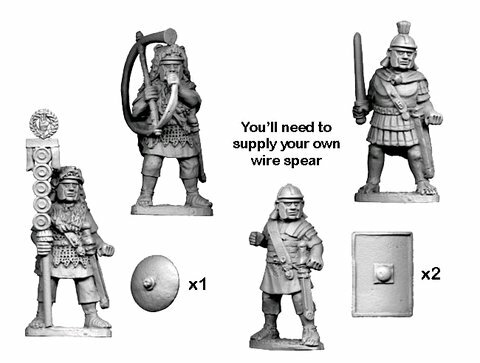 Figures are 28mm sized, made of metal and supplied unpainted.